​Professor Yoshida moved to Hilo this year in May to be Director of Subaru. He had lived in Hilo 22 years ago; Hilo has not changed, happily. From Mauna Kea, the telescopes peer into the universe for life. Europa, a moon of Jupiter, has a very big ocean underground. Could there be life here? Enceladus, a moon of Saturn, has water jets that could indicate a great ocean deep inside with water erupting through holes. Could there be life here? More than 3,000 extrasolar planets have been discovered. The method of discovery and analysis is constantly improving. The Kepler 186 solar system has a planet similar to earth. This planet was discovered indirectly by detecting a shadow of the planet as it passed its sun. To learn more, one needs to to see the planet directly. This is the current Subaru challenge. 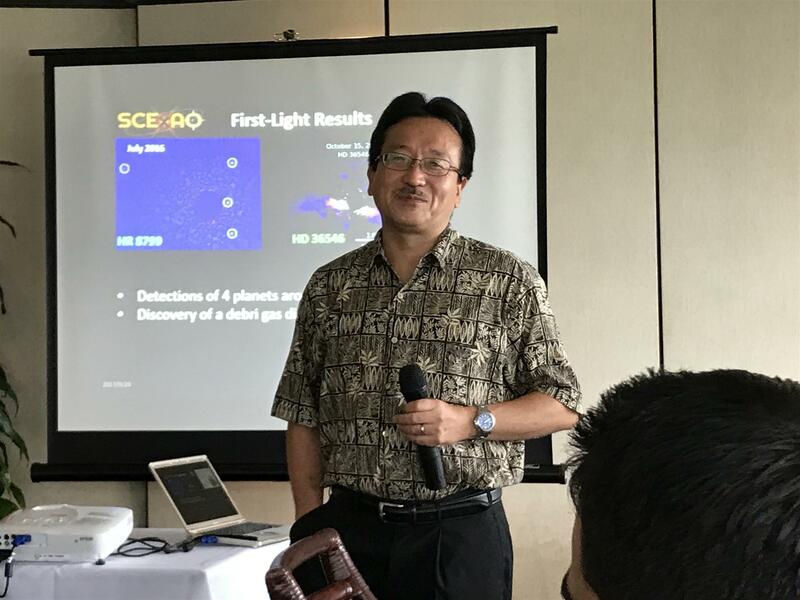 Subaru is working on a high resolution imaging for direct observation that corrects for atmospheric dispersion (called SCEX-AO). Another method is to use an infrared Doppler spectrograph to detect subtle wobble. The TMT would significantly advance the high resolution capability for direct observation. We are fortunate in humble Hilo to learn from and be inspired by the cutting edge advances of Subaru and the other telescopes. To explore strange new worlds, to seek out new life and new civilizations, to boldly go where no one has gone before.